Comfortable 1.5 hour tour across Intramuros when the sun has gone down! We will start when the sun is about to set and cruise through the lighted streets of Intramuros. 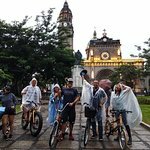 Experience a Manila specialty—a bamboo bicycle— on this small-group night cycle tour of Intramuros, Manila’s historic walled city. Traveling in an intimate group, with a maximum of 15 people and a guide, soak up the atmosphere as bright lights glisten on the waters of the Pasig River. 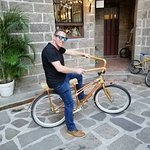 Besides classic sights like Fort Santiago and Plaza San Luis, enjoy the chance to pedal along the walls of Intramuros itself as well as a complimentary craft beer or iced tea at the end of the tour. Bambike Ecotours - Night Edition: An Interesting way to tour the city and learn its history! Get quick answers from Bambike Ecotours: Intramuros Experience Night Edition staff and past visitors.